This touchless keyboard utilizes infrared light beam detection technology to avoid pushing down key buttons on a keyboard. As seen in the above photo, each key area is surrounded by walls. Each wall has a slit to let a light beam pass. Two light beams cross above each label. When an opaque object, such as a finger or a pencil head, is put inside a cell and blocks both light beams, a key-down signal is triggered. When the object leaves and unblock the light beams, a key-up signal is generated. This keyboard has all the keys and can perform all the functions that a standard keyboard has. When the light beam passing a row is blocked, the left LED lights up. When the light beam passing a column is blocked, the right LED lights up. A key stroke is generated only when both LED light up. When you plug this keyboard into a Windows computer, the computer will search for Windows Update for driver. Just click on the "Skip..." link and the default driver will load. No need to find any other driver to install. 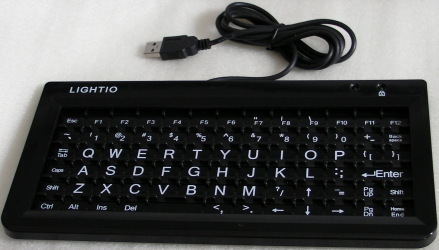 When you plug this keyboard into a Mac computer, there is usually a message box asking for identying the keyboard by pressing the RIGHT Shift key. But when you trigger the Shift key on the right-hand side, sometimes the message box doesn't disappear. However, just wait several minutes and computer will take inputs from this keyboard. To connect a USB keyboard to the iPad you must have the Camera Connection Kit accessory. The Camera Connection Kit adapters plug into the Apple 30-pin dock connector port. One of the adapters has a USB port that is officially advertised as a way to connect your digital camera directly to the iPad. It as been tested that connecting this USB keyboard to the adapter works. It is observed that on about half of the computers this keyboard is plugged in for the first time, the Caps LED is turned on and seems reversed with the letters typed. But it becomes normal when the computer restarts. This keyboard is thin and flat. By using a wrist support and elevate your wrists above the top of the keyboard, a flat wrist with no bending and forceful pressure can be achieved. This setup reduces the strain and force on wrists and hand significantly. Try not to press hard on the bottom surface. This is a habit carried over from pushing down button-keys, and is also a factor causing pain and RSI. With our touchless keyboard, when your finger is getting close to the bottom, or touching it very lightly, it is usually deep enough to block the light beams and perform the key-down action. Reducing the force you use needs attention for many first time users. Try different postures from time to time. Most people would place the touchless keyboard on the desktop, in the place of the old big keyboard, or beside the laptop computer. It's true that some of the benefits of the design of this touchless keyboard can be enjoyed, such as the direction of the keyboard can be tilted so the wrist can be neutral, and the thin, flat feature can avoid the bending of the wrist, but the stress on the shoulder and the strain on the lower back is not reduced much for this seating posture. What this design of the keyboard offers is the comfortable posture that can hardly be used before. You can hold it in one hand, place it on your lap, and use another hand, or with a pencil to perform key strokes. In this posture, you can lay back to your chair, put your feet on the desk, or lean forward from time to time to reduce the stress on your lower back. You can also hold it in one hand and stand up from time to time. Anyway, the small size and light weight facilitate many different postures that you can use during your long working hours to avoid repetitive strain injuries to many parts of your body. Try to use one hand as the dominant working hand, and switch hands from time to time. The size of this keyboard is designed to be small and operable with either one hand or two hands. Actually, one hand typing with this small keyboard is not necessarily slower than using 2 hands on a bigger keyboard. Switching working hand from time to time can reduce the fatigue and the chance to be injured.